It may sounds like science fiction, but the printer you buy in the future could be able to produce a real-life object from images on your computer. Several companies are working on developing low-cost three-dimensional printers which could eventually find their way into the home. The machines work by placing layers of a powdery material on top of each other to create a real-life model of a digital image. "With hundreds and sometimes thousands of layers, we can develop a prototype that works, from coffee cups to car parts, in a variety of textures and colours," said Andy DeHart of the Z Corporation which makes 3D printers. The Boston-based company was showing off its technology at the recent computer graphics Siggraph exhibition in the US. "We can import data from any digital source," Mr DeHart told the BBC programme Go Digital. "The data is brought into our print driver and then manipulated and exported to the 3D printer." 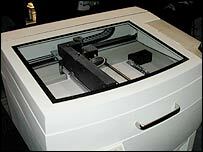 The Z Corporation machines use a technology to bind the powder first invented by the Massachusetts Institute of Technology. It works by spreading a thin layer of powder which is shaped by a liquid sprayed from an ink-jet print head adapted from a Hewlett-Packard design. The machine then repeats this process, building up layer after layer of powder until the object is complete. "The printer is a slicing technology," said Mr DeHart. "Much like putting ink on paper, it prints on powder and places a binder or glue during the layering process." 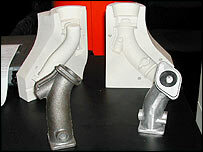 For the powder, the company uses plaster, but it has also used a ceramic material to create more lasting models. Leading companies such as Sony, Adidas and BMW are using the 3D printing technology to create prototype models as it is faster and less expensive than using traditional methods. Mr DeHart from Z Corporation said the technology could make it to the High Street, with printing shops offering 3D models as well as conventional photocopies. "We don't feel our technology is expensive," said Mr DeHart. "Our entry level system starts at $30,000 and that system can support all powder types and all the geometric models."